With all the joy that comes with the holidays, it seems there’s always just enough stress tagging along to distract you from the things that truly matter: Christmas lights going out, a burnt holiday turkey, your aunt having too many glasses of wine at the dinner table. Whatever mishaps face you this holiday; a relaxing weekend is what you’ll need once January 1 rolls around. Enter La Cantera Resort & Spa. An easy three-hour drive from Houston, La Cantera whisks you away to one of the highest points of the San Antonio Hill Country. It’s a one-stop-shop for rejuvenation – and great eats. Four-time James Beard Award finalist Chef Andrew Weissman just opened his newest restaurant, Signature, at La Cantera, which promises upscale, yet relaxed dining, with a modern, Texas spin. Let’s step back and set the scene: The crunching of gravel is the first thing you hear, driving up a winding driveway situated between rolling hills. A breeze brushes past you, allowing you to smell the faint sweetness of rosemary and lavender before you’re greeted with a friendly smile as you step out of your car and into a redesigned vintage building. You deserve this. First things first. Among La Cantera’s array of dining options, perhaps the most anticipated is Signature. Chef Weissman’s is serving up a refined, yet rugged, experience you can’t find anywhere else. Thanks to on-site herb, fruit and vegetable gardens and Texas-sourced ingredients, such as quail, venison, and olive oils, everything that comes to the table promises to be genuine, authentic, and above all, comforting. The setting of Signature is quite possibly what makes it so special. Overlooking the views of rolling Hill Country paired with a southern-inspired menu transports guests out of Houston, out of San Antonio, and most importantly, away from the packed dinner table you’re sure to be sitting at for the next month. 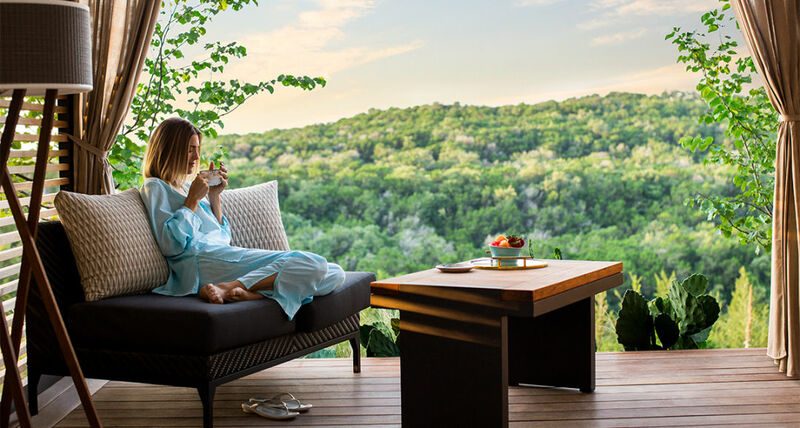 After a night of fine dining at Signature, in comes Loma de Vida, the new on-site spa at La Cantera. Loma de Vida provides the opportunity to customize a day of massages, body treatments, facials, and more. It is your chance to relax, unwind, recharge, and most of all, slow down and enjoy each moment. Loma de Vida offers a distinctive escape that encompasses a salt-water grotto, sky lofts, and private garden cabanas, allowing you to experience renewal. The experience of La Cantera Resort & Spa is just what you need, and the views of the sweeping Texas Hill Country only add to your “deep breath” of a weekend after the holiday season. Whether it’s a girls’ trip, a romantic getaway with your partner or even a solo weekend to gather your bearings, there’s something to do the trick at La Cantera.